Dr. James Stott McDiarmid was born on the 22nd of January, 1879 in Highgate. His parents were Hugh McDiarmid and the former Kate Mitton and he had a younger sister named Jean. Dr. McDiarmid’s father Hugh, was a school teacher. His family moved to Ingersoll, Ontario where Dr. McDiarmid attended public school. Dr. McDiarmid graduated from Ingersoll Collegiate High School and enrolled in an arts program at The University of Toronto. After completing 1 year in Toronto, he transferred to the B.Sc. program at McGill University. It appears he completed the course and left the university in 1905. He returned to McGill in 1911 and graduated M.D.,C.M. in 1913. He married Grace Robertson on the 22nd of December, 1915 in Ingersoll. 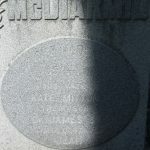 Mrs. McDiarmid was born on the 29th of March, 1885, the daughter of Rev. John Robertson and the former Annie Edwards. Her father was a Baptist minister and she had a younger brother named Thomas. An ad appears in the November 2nd, 1918 edition of the Chatham Daily Planet reporting that Dr. McDiarmid was taking over the practice of Dr. C. R. Newman. According to the 1921 census, Dr. and Mrs. McDiarmid and their children, Max and Catherine Louise were living in Dover Township (Kent County) and Dr. McDiarmid was practicing medicine. He eventually moved his practice to Ridgetown and he was known to be an avid gardener. Dr. McDiarmid retired in 1931 due to ill health. By 1935, records indicate that the McDiarmid’s were living on Lisgar Street in Ridgetown and Mrs. McDiarmid was working as a nurse. 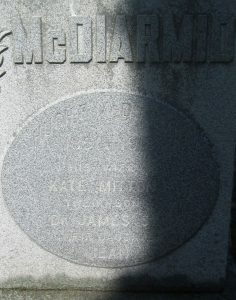 Dr. McDiarmid died at Victoria Hospital in London on the 30th of November 1941. 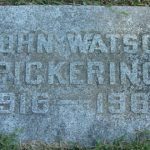 He was buried at Greenwood Cemetery in Ridgetown near his parents. 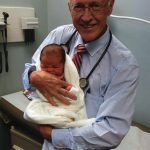 *Dr. Curtis Richard Newton also appears on the Chatham-Kent Physician Tribute website.